Billy Wilson, Director/Choreographer, was a native of Philadelphia where he received his early dance training at the Sidney King School. At fifteen, he received a scholarship to study classical ballet with Antony Tudor, artistic director of The Philadelphia Guild Ballet School and company. At nineteen, he made his New York debut in the City Center production of CARMEN JONES followed by appearances in the Broadway production BELLS ARE RINGING, starring Judy Holiday and JAMAICA, starring Lena Horne. He left America with original London production of WEST SIDE STORY after which he was invited to be a soloist with The National Ballet of Holland (now named The Dutch National Ballet) where renowned choreographer Serge Lifar created the ballet OTHELLO for him. This role established him as an international ballet star. Returning to America he headed the dance departments at Brandeis University and the National Center for African-American Artists, directed the famous Hasty Pudding Theatricals at Harvard and headed his own company The Dance Theater of Boston. He choreographed the twice Emmy Award winning children’s television show ZOOM! On Broadway, Wilson created the choreography and musical staging for eight shows, two of which he directed and three of which were Tony nominated. His work on Broadway included, THE ODYSEEY, starring Yul Brynner, BUBBLING BROWN SUGAR, EUBIE!, the all black version of GUYS AND DOLLS, STOP THE WORLD I WANT TO GET OFF, starring Sammy Davis Jr., DANCE A LITTLE CLOSER, THE LITTLE PRINCE, starring Michael York and MERLIN, starring Chita Rivera. Sonja van Beers and Billy Wilson in the 2nd Movement of Balanchine’s ‘Symphony in C.’ Early 1960’s. He received numerous awards for his work including an Emmy Award, a Charlie Award, and nominations for the Drama Desk Award, his three Tony nominations and the list goes on. Over the course of his diverse career, Wilson choreographed nearly thirty ballets for some of the most celebrated companies both here and in Europe. 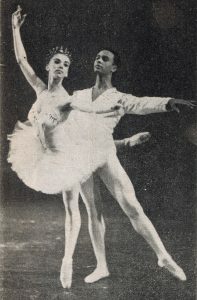 His ballets continue to be in the repertoires of such companies as Philadanco and The Alvin Ailey American Dance Theater, where his last ballet THE WINTER IN LISBON was chosen by Ms. Judith Jamison to be included among her favorites when she was honored at City Centre before handing the torch to Robert Battle. One of the aspects of his career that made his success unique was his ability to simultaneously straddle Broadway, the ballet world and academia consistently and seamlessly. He enjoyed a very exciting and successful residency, for over five years, as Associate Professor at Carnegie-Mellon University in the Fine Arts/Drama Department in Pittsburgh, PA.
Toward the end of his life he made more time for work in Europe, especially The Netherlands where he taught, created ballets for companies like Opus 1 and two original hit musicals: A NIGHT AT THE COTTON CLUB and JOSEPHINE (the story of Josephine Baker). In 1994, he re-staged and updated one of his most commercially successful contributions to the musical stage, BUBBLING BROWN SUGAR which once again enjoyed a highly successful run throughout Europe. Of all the many accomplishments, Billy Wilson was most proud of his inclusion into the 1978 edition of Who’s Who Among Black Americans and his two children Alexis and Parker.